Copyright © 2000-2008 Spadix Software. 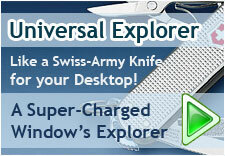 Universal Explorer (UE) - a super turbo-charged Windows Explorer File Manager - plus more!! It is a powerful Windows Explorer replacement software designed to replace the rather restricted features of the standard Windows Explorer File Manager. It is fully featured and offers many advantages to Windows Explorer. In addition, UE comes fully loaded with a wide range of great utility tools: Find Files, Search Text, Replace Text, Split File, Encrypt/Decrypt, Disk Copy, Directory Size, Directory Printer, Directory Compare, Set Properties, Batch Rename, Slide Show, Thumbview, Screen Capture, Calculator, ASCII List, Color List, System Information and Hex Window.